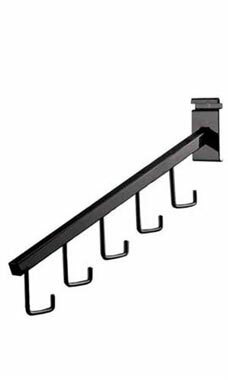 Maximize the space that you have available on your Gridwall or Wire Grid Unit with this Black 5-J-Hook Waterfall Square Faceout! By maximizing space, you can display more items neatly and efficiently. Featured in a sleek black finish, this waterfall Faceout will look great in any setting you put it in. The J-Hook design of this faceout will help attract customers, as it increases visibility of the merchandise on display. In stock and available for immediate shipment. Great item. Waterfalls are perfect for displaying handbags, scarves, belts and any items that are bulky and need to be displayed offset or varying patterned merchandise. It allows customers to see all items simultaneously and makes it convenient to remove one item without disturbing the other items on the rack. A must for any retailer. These hold all my clothing and handbags perfectly. Very heavy and sturdy. They hold bags wonderfully without giving the look of a cluttered straight peg. Great display for my diaper bags and purses. Makes it easier to see all I have to offer. The slanted design draws your eyes to the product hanging. Simple to put on and take off the grid screen. We purchased these to offset some products that had various designs. They are very visible this way. These are great for accessories or clothing! Saves lots of grid space for products of either many colors or sizes. Especially small items. Customers can see both very easily and access the correct color or size without a problem. I love that the hangers are below and you won't have to take all of the front inventory off in order to get a size or color you need in the back of the arm. This product is heavy and very nice. It holds up to 5 different products and it makes it look very professional. Used for hanging scarves, purses, hangars with items. Very versatile. Nice, heavy duty. Sturdy. Durable. Great size and length. Used to hang my purses at the marketplace.. beautifully displayed. I use these on a foldable rack I have for events. Instead of buying more racks I have expanded the space with these. They are really heavy duty. Can put heavy items on them. This Waterfall Hook has made my new area to hang my purses look amazing! I purchased 10 of these to go with my wire grid wall panels. You should see how amazing this new display looks!! Used to hold handbags and it work really well on the grid.